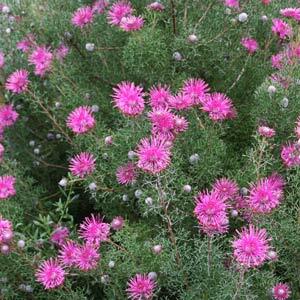 One of the often neglected species is Isopogon dubius, commonly called the ‘Rose Pink Cone Flower’. It naturally forms a compact rounded shrub and with masses of rose pink flowers is a standout native plant when in flower. Best described as a low growing upright shrub, this is a drought tolerant plant from Western Australia. The named cultivars of tidy little plant will reach around 1m in height with a similar spread. The species itself will be taller, however still a good plant. Excellent in a rock garden, grown in the garden border, or when used as a container plant. Spring flowering and very attractive to bees and birds this is a very low care plant once established. We suggest regular pruning after flowering (deadheading) to maintain a really nice shape, and promote a more prolific flowering habit. Well drained soil. In poor drained soils, consider hilling up the garden bed to improve drainage. Or improve soil structure by adding appropriate material. This is a species that requires a slightly acidic soil to thrive. Will grow in larger containers. Water through first summer allowing to dry between waterings. A slow release native plant fertilizer once a year is sufficient. When container growing you need to ensure that you are using a specialist Australian Native plant potting mix. These are free draining and contain different fertiliser to othe potting mixes.